One of the world's most popular culinary herbs, parsley has many nutritional and health benefits and should often be incorporated in one's diet. Parsley was discovered in Southern Europe and has been cultivated for over two thousand years. The ancient Greeks used parsley to decorate tombs as well as to crown the winners of many athletic competitions. During the medieval times, parsley was used as an anecdote to treat people who had been poisoned. Although originally known for its medicinal properties, it is now one of the most widely utilized herbs primarily used as a decorative garnish atop salads and cooked meats. Parsley is rich in phytonutrients, vitamins, minerals and volatile oils, all of which help to enhance the working ability of organ systems as well as the body’s ability to absorb and assimilate nutrients. Parsley’s therapeutic benefits include its use in aiding with digestion, alleviating fatigue, helping dissolve gall stones, acting as an immune booster and improving cholesterol levels. In women, parsley helps pacify PMS symptoms through the regulation of estrogenic constituents. It also aids with the regulation of menstrual cycles and minimizes menstrual pain. Parsley is a great energy booster as it is high in both vitamin B12 and essential fatty acids. Further, it provides glandular support to both liver and kidneys. Parsley helps improve kidney function through aiding with the reabsorption of salts. An effective blood purifier, parsley helps to clear toxins in the liver thus improving liver function. Although parsley is one of the most nutritious herbs with significant benefits, it is not used frequently, aside from as a casual garnishing agent. Seeing some of the health perks it provides, it might prove valuable to incorporate its use in our diet on a more regular basis and in a more noteworthy manner. Season each pork chop with salt and pepper. In large skillet, heat olive oil over medium high heat. Cook pork chops about 4 to 5 minutes, turning once, until lightly brown. 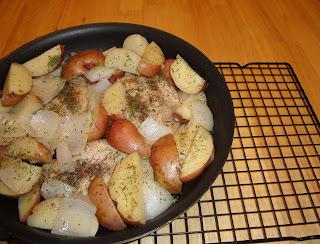 Add chicken broth, potatoes, onions and garlic. Bring to boil, then reduce heat. Cover, and simmer 30 minutes. Garnish with parsley. Enjoy! Looks good, Christine. Simple ingredients make the best meals sometimes. This sounds good. Hi Christine! I love parsley and I think Ina Garten has had a big hand in making it more popular here in the US....she's a fan of it, too! As always- great post! I like the one skillet meals. Looks good. Looks delicious and I would love to have you cook for one day. You know your stuff Christine. Pure, delicious and perfect feel-at-home food! Nice way to prepare pork chops, the boiling part I am sure makes them tender and moist. Yum! I never knew parsley could be so good for you! This is a great dinner. Simple and delicious! Hi Kim Bee, I would love to cook for you one day... I like to feed people. Thank you! I guess I need to use more parsley! Great recipe! Wow I didn't know parsley had so many health benefits. Maybe I'll use it more than just a garnish! I get to know parsley better from you. I love parsley and I make fish fillet soup with lots of ginger and parsley. That goes so well with some fragrant rice and it can be a simple but flavorful meal for me. Oh, gosh, nothing better than a one pan meal...my family adores chops and potatoes! Thanks! Thanks for giving us all those information about parsley. I use this herb a lot. BTW your recipe sounds very tasty! I always have fresh parsley on hand so I am very happy to learn about its health benefits. This looks like a terrific skillet meal. I love to add parsely to dishes. It's probably the cheapest herb you can get year around. Terrific information, I'm glad I was on the right track. Love the dinner too! I have to have cilantro, basil and Italian parsley in my fridge. I grow other herbs, but those I get at the grocery or farmers market. I love how versatile parsley is. Great post!